Serving Farmington, NM since 1958. Kristy was born and raised in Farmington and loves the local culture of the beautiful four corners area. She graduated with her Bachelor’s Degree from Easter New Mexico University in 2009. She married her husband, Jeremy, in April, 2014 and their first son, Camden, was born June, 2016. She and her family enjoy the outdoors and spending time at the lake in the summer. Alexandria Moreno was born in Arizona and moved to Farmington when she was five years old. The Four Corners area has always held a special place with her because of its vast variety in terrain and culture. She graduated from Piedra Vista High School in 2013 and immediately began her college studies for Nursing. 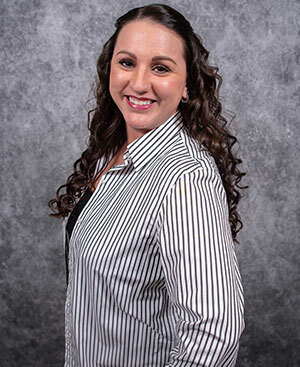 After obtaining a job at Sandia Hearing Aids she soon realized nursing was not the career path she wanted to take in life, instead she wanted to be able to give the gift of hearing to as many people as she could. We Continue With Our Great Services! It’s been a difficult year with the passing of the two owners of Sandia Hearing Aids, David and Jessica Saxon, and they will be dearly missed. Thank you for your patience, support and understanding during this difficult year for us at Sandia Hearing Aids. David and Jessica purchased Sandia Hearing Aids in 2007 with the commitment to provide exceptional hearing healthcare care to our patients, friends, family and the whole community. 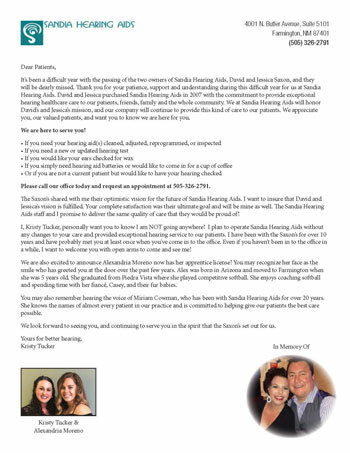 We at Sandia Hearing Aids will honor David’s and Jessica’s mission, and our company will continue to provide this kind of care to our patients. We appreciate you, our valued patients, and want you to know we are here for you. The Saxon’s shared with me their optimistic vision for the future of Sandia Hearing Aids. I want to insure that David and Jessica’s vision is fulfilled. Your complete satisfaction was their ultimate goal and will be mine as well. The Sandia Hearing Aids staff and I promise to deliver the same quality of care that they would be proud of! I, Kristy Tucker, personally want you to know I am NOT going anywhere! I plan to operate Sandia Hearing Aids without any changes to your care and provided exceptional hearing service to our patients. I have been with the Saxon’s for over 10ears and have probably met you at least once when you’ve come in to the office. Even if you haven’t been in to the office in a while, I want to welcome you with open arms to come and see me! We are also excited to announce Alexandria Moreno now has her apprentice license! You may recognize her face as the smile who has greeted you at the door over the past few years. Alex was born in Arizona and moved to Farmington when she was 5 years old. She graduated from Piedra Vista where she played competitive softball. She enjoys coaching softball and spending time with her fiancé, Casey, and their fur babies. You may also remember hearing the voice of Miriam Cowman, who has been with Sandia Hearing Aids for over 20 years. She knows the names of almost every patient in our practice and is committed to helping give our patients the best care possible. We look forward to seeing you, and continuing to serve you in the spirit that the Saxon’s set out for us.